In addition to laser experiments, I thought you’d like to learn how to pick up sound that’s traveling on a light wave. A crystal radio is among the simplest of radio receivers – there’s no battery or power source, and nearly no moving parts. The source of power comes directly from the radio waves (which is a low-power, low frequency light wave) themselves. 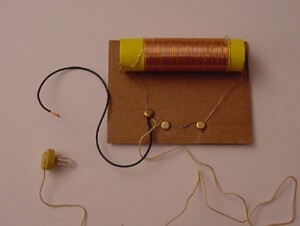 The radio is made up of a tuning coil (magnet wire wrapped around a toilet paper tube), a detector (germanium diode) and crystal earphones, and an antenna wire. One of the biggest challenges with detecting low-power radio waves is that there is no amplifier on the radio to boost the signal strength. You’ll soon figure out that you need to find the quietest spot in your house away from any transmitters (and loud noises) that might interfere with the reception when you build one of these. One of things you’ll have is to figure out the best antenna length to produce the clearest, strongest radio signal in your crystal radio. I’m going to walk you through making three different crystal radio designs. You’ll need to find these items below. can you put a speaker on it? Hello again. Where can I buy magnet wire? Not all experiments come with worksheets, but many do. Silly question, but want to be sure. Do all experiments come with worksheets or does it vary? That radio came in a kit, so I am not sure which capacitor type it was. But you can make your own capacitor by making the one with the long tubes of paper and foil in the model shown later in the video. What type of variable capacitor is used in the second example? Unfortunately not easily, due to the nature of how the radio works (the sound energy you hear comes from the wave itself). 1. Is the magnet wire coated except for just at the ends where you sanded to make good connections? You can test this with a light bulb and a battery back to be sure the wire is making a good connection. Just hook up the wire and make sure the LED comes on. 2. Is the diode in the correct way? The stripe indicates the direction. 3. Grounded – what did you ground the ground wire to? 4. How long is your antenna and what is it connected to? 5. Confirm you are using a crystal earphone, not a earbud that comes with MP3 players and cell phones. Those will not work. Tried everything — all the troubleshooting advice, etc. Still not working. Bought all the supplies from the links on your website. The wires we received don’t look as big as the one you’re using in the video, but it is the one linked to the experiment supply list from Jameco. Is that a problem? If the science kit is one of ours, on the bottom of this page are two links to documents that will match up e-Science with Science Mastery. Is there an easy way to tell if the materials come in the science kit I bought? Also which kit and which label? Thank you so much. No they are two different technologies. can the crystal radio be combined with the FM transmitter as one piece? Start with 50′ and see how it works. If you can’t get a signal, then try 100′ by connecting two spools together (strip the wire ends from both and connect the metal ends). Depending on where you live, you might be able to get away with a shorter antenna. Yes you can snip off the end using wire strippers to expose the bare wire. It doesn’t look like radioshack is carrying the 100′ insulated wired. The link goes to a 3 pack of 25′ wire spools. After searching, I found 50′ wire, but that is all. Where else can this be found? The crystal earphone from C. Crane has a plug in the end and your demo shows raw wires. Is this adaptable or should I be looking for another product? My son believes that we can cut the end with wire cutters to make it work. Is this accurate? Thanks. Grounding it will seriously boost your signal strength – make sure you’ve grounded it to a non-painted metal pipe, like a sink faucet. You want a metal-to-metal connection anytime you hook up wires to each other, as electricity won’t flow through plastic insulation. An antenna of at least 40 feet should give a decent signal. You want to use a HAND SET, not a head set. And not all hand sets work – you may need to experiment with a few of them, but since they simply plug in, it’s easy to test different ones. You need a non-magnetic one (but this isn’t always obvious) – older phone hand sets usually work better. If you have a crystal earphone you can try that also. Earphones like from an iPOD will NOT work. Make sure that you are close to a strong radio source or you won’t pick up much. Are you using the diode I sent to you? Make tripe sure it’s in the right way, or it won’t allow the signal to come through. Okay I am not sure what happened but it is not working. We’ve tried everything. Grounded it — made sure the wires were attached. It still isn’t working. I bought a phone head set from goodwill and stripped the wires down– could that be in. Should they remove the plastic coating off of the wire before attaching it or leave it on? Used hookup 22 gauge wire. They wanted it really long so they attached all three of them together. We used the one from radio shack (278-1224) … still nothing. Any suggestions? Thanks– I went to Radio shack and bought the one you mentioned. No – the wire must be insulated in order for the electrical circuity to work (otherwise, you’ll short-circuit your wiring and you won’t hear anything). You can use magnet wire or coated wire. In the video, it does look like I’m using naked uninsulated, but that’s because the insulation is clear. We have some 26 GA wire but it isn’t insulated– can we still use it for this experiment?